Safety measures that could save your life in space. 1.1 All personnel should have unrestricted access to welding tool. 1.1.1 When possible, all personnel should have charged welding tool with them. 1.2 A personal weapon with at least one full clip must be issued to every crew member. 1.2.1 Use of weapons must be announced to prevent friendly fire. 1.3 Distribution of explosives must be limited to boarding parties only. 1.3.1 Use of explosives must be authorized by commanding officer. 1.4 Every station and ship should have stimpacks onboard whether put in the emergency case in the Outpost or stored in the cargo bay. 1.4.1 At least two stimpacks must be issued to each member of boarding party. 1.5 Mining ships should have at least 2 raw resource canisters and a battery per mining tool onboard. 1.6 Wearing EVA suit with a jetpack and helmet is mandatory at all times. 1.6.1 Proteus helmet must be taken off and Mk9 helmet should be open within breathable atmosphere. 1.6.2 Ships should have 2 jetpacks per crew member onboard. 1.6.3 All airlocks on stations should have at least 1 EVA suit with fully loaded jetpack and a helmet. 1.6.4 Proteus EVA suits should be issued to experienced crew members only. 1.6.5 Every crew member checks and recharges their EVA suits themselves. 1.7 Charged fire extinguishers should be present in any living quarters, life support module and modules that have exits to space. 1.8 A deuterium canister, a nitro canister, oxygen and nitrogen canisters should be present on any ships whenever possible. 1.9 Small cargo canisters with 2.5 litres of oxygen and 2.5 litres of nitro should be held in cargo bays when possible. 1.10 All equipement, parts and items should be locked or placed on shelves to prevent unnecessary loss or casualties when maneuvering. 2.1 Exit to outer space should be authorised by pilot. 2.1.1 Speeds of the ship and targer should be matched prior leaving the ship. 2.2 Always check fuel, oxygen and power levels in the suit before exiting to space. 2.3 Do not throw objects in space. 2.4 Whenever possible, check hull from the outside and fix damage before returning to airlock. 2.5 Always announce if you are staying outside beyond the expected time of return. 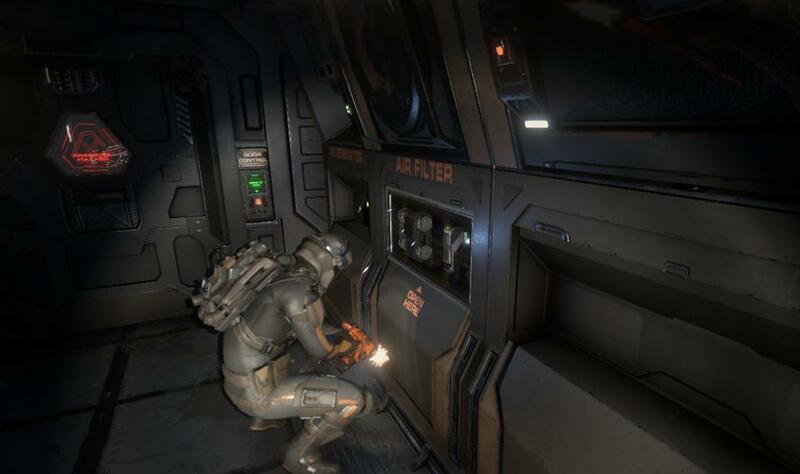 2.6 Do not override airlock and cargo bay doors if pressurisation is possible. 3.1 Prior to piloting the ship, ensure that there is enough fuel, propellent, oxygen and nitrogen on board, all internal systems checked and working, external engine and RCS modules intact, there's at least one working solar panel and hull condition can keep air at the main deck. 3.1.1 Ensure that solar panel can get sun coverage during the flight and after arrival in case of reactor being offline. 3.2 Do announce readiness to undock. 3.2.1 Use of elevator while undocking is prohibited. 3.3 Do announce readiness to dock. 3.3.1 Use of elevator while docking is prohibited. 3.4.1 Use of elevator during start and end phases of warp flight is prohibited. 3.5 Check the course for warp for possible collisions before engaging. 3.6 Main engine should be fired only if there's no visual obstacles between the ship and destination. 3.6.1 Do not use main engine when there's no objects that could help measure your relative speed. 3.6.2 Brake with main engine and disengage it at 20-30 mps within 2 km from inhabited stations. 3.7 Use only RCS for approach within 2 km from stations. 3.8 Ensure that all crew members have left airlock before applying RCS or main engine. 3.8.1 Opening outer doors from the airlock or cargo bay while maneuvering is prohibited. 4.1 Every station should have at least 1 functional airlock. 4.2 Airlock doors should be closed when docking. 4.3 Check station condition after docking, both from outside and via Life support terminal. 4.3 1 In case of a breach, turn off life support for damaged modules until repairs are made. 4.4 In case of pressure warning within the station, ensure that the door to pressurised module is closed before attempting to open door marked with pressure warning. 4.4.1 Always read warning signs and indications on doors. 4.4.2 Do prepare for opening the marked doors by wearing Proteus helmet or closing Mk9 helmet. 4.5 Do not walk straight in the room where potentially hostile turret is located. 4.5.1 Keep as much space as possible free from obstacles to retreat. 4.6 Fix as much damage as possible before leaving the station. 4.7 When leaving station unmanned for a long time, close all doors, depressurise airlocks, turn off life support and power systems. 4.8 Keep safety covers on undock levers closed when the levers are not in use.